search has been anchor text. keywords) that are hyperlinked – the blue link at the beginning of this sentence being the perfect example. were the ones that got the riches. matching anchor text to the letter; for example a link to an SEO page would use “SEO” as the text) in content, comments, forums – anywhere. ranking factor, opportunist SEOs had a field day. everything. It did and it wasn’t pretty, at least not for SEOs. embarrass you in front of your friends. It probably smoked too. Anchor text is dead, long live anchor text! 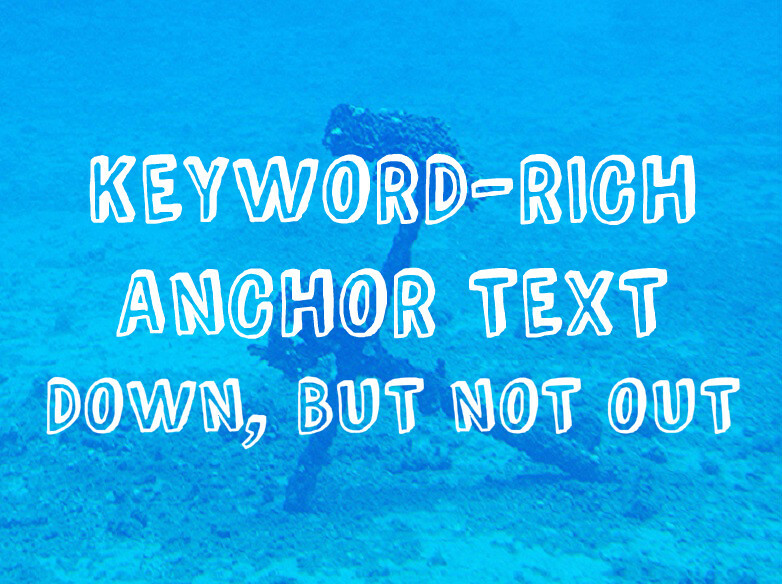 So where are we at today; is keyword-rich anchor text dead? joker it was in the past, but there’s life in the old dog yet. the best policy. Anchor text has to be diverse and, more importantly, natural. text – Google likes to promote brands, because brands take time to build. text is basically a combination of your brand name and your targeted keyword. your anchor text should be naked links – your URL with and without http and www. Simple, effective and brilliantly easy. particular, keep it varied – everything in moderation. up on the Google scrapheap, and you really don’t want to be there. will be able to tell you. The bottom line, however, is this: keep anchor text au-naturel. it – preening is overrated anyway.